Kids need to see that writing and reading can be fun! advanced young readers or ages 10-15 and up. when a group of classmates target Stephen for bullying. kicked off his baseball team. hounded by certain classmates, the damage bullying does to the young victims, their families, the school, and yes, even the perpetrators. diligently to make his day to day life in school a kind of hell. Enter the angels, a few close friends and his parents, who with kindness and dignity, help balance out the cowardly, unethical and secretive actions of the bullies. Stanley Barber, Artistic Director of Pax Amicus Theatre and Castle Shakespeare Repertory and former high school and college educator. their families. Thank you Daryl Cobb for writing a book that will touch the heart of all its readers! reading for all our schools. I recommend the book to you as well it is well written and will hold your attention to the end. As a current school district superintendent and former principal, I am closely involved with the kind of issues that Daryl Cobb addresses in Baseball, Bullies & Angels. This book is a mixture of feelings. It gives a good lesson. At times it is sad then it turns into funny and calm. Great book. By R. Tucci "Awesome mom"
a lot about bullying and how important it is to understand about it. this book explains it simply with a great story. 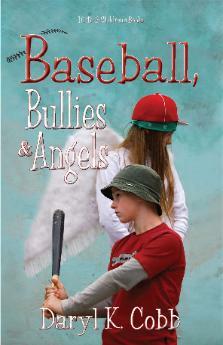 Baseball bullies and angels will appeal to boys and girls. are too well aware of: bullying. Daryl Cobb is inspiring children to read and write!